Living trusts are flexible estate planning structures that can be tailored to satisfy a range of planning needs and wishes. Because you will generally serve as the trustee and maintain full control over the assets placed in trust during your lifetime, a living trust offers what many consider to be the most valuable benefit of all: peace of mind. Following are some of the most compelling reasons to create a living trust. Reason No. 1 — You can avoid probate. A living trust is often used as a “substitute will” to transfer assets to heirs and avoid probate. 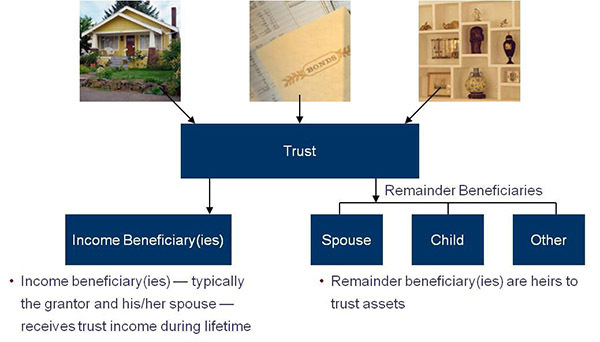 Individuals typically place all assets in a trust and name themselves as income beneficiaries during their lifetime. Upon death, remaining trust assets are passed on to designated heirs without the need or cost of passing through probate court. Callout: Tax Tip — Income from property held in the living trust is reported on your personal income tax return. No additional forms or filings are necessary as long as you are both the “grantor” (i.e., the individual who set up the trust) and the trustee and the trust uses your Social Security number2. Reason No. 2 — You become incapacitated. While other planning mechanisms, such as a durable power of attorney, can achieve similar objectives, a living trust is a more flexible, user-friendly alternative. In the event that you become incapable of managing your financial affairs due to physical or mental illness, assets in a living trust may be managed by the person you named to serve as successor trustee at your death (or, if you made a shared trust, the other trustee, typically a spouse) in keeping with your wishes. Keep in mind that with a living trust, nothing is “set in stone.” Because it is a revocable instrument, you can amend or revoke a living trust at any time. If the trust is shared with a spouse or partner, both of you must agree on changes, but either of you may revoke the trust at any time. Reason No. 3 — You lack the ability or desire to manage your own finances. Perhaps you feel overwhelmed by the thought of managing the sizeable inheritance you just received. Maybe you are a widow who always relied on your spouse to handle the finances. Or maybe you are a busy entrepreneur who would rather entrust the management of your wealth to a competent professional. Whatever the reason, you can name a trustee (e.g., a bank or other financial institution, or a trusted individual) to manage the trust’s assets for you. If a professional trustee is named, that entity is bound by law to take great care in managing and protecting your assets. While a living trust can greatly simplify estate planning, it would be misleading to present it as a cure-all solution. Contact me to learn more about the benefits and limitations of living trusts and other potential tools to include in your overall estate plan. Source: Nolo’s Guide to Living Trusts, Nolo.com, 2009. • IRA - IRA Individual Retirement Account: You may be able to claim a deduction on your individual federal income tax return for the amount you contributed to your IRA. The deduction may be limited if you or your spouse is covered by a retirement plan at work and your income exceeds certain levels. For 2014 and 2015, your total contributions to all of your traditional and Roth IRAs cannot be more than: $5,500 ($6,500 if you’re age 50 or older), or your taxable compensation for the year, if your compensation was less than this dollar limit. Roth IRA: A Roth IRA cannot be claimed as deductions but qualified distributions are tax free. Unlike IRAs, contributions can be made even after the age of 70½ years. Most other provisions of a traditional IRA apply to Roth IRA. SIMPLE Plan: A SIMPLE IRA plan (Savings Incentive Match Plan for Employees) allows employees and employers to contribute to traditional IRAs set up for employees. It is ideally suited as a start-up retirement savings plan for small employers not currently sponsoring a retirement plan. The amount the employee contributes to a SIMPLE IRA cannot exceed $12,000 in 2014 and $12,500 in 2015. The catch-up contribution limit (50 and above years of age) for SIMPLE IRA plans is $2,500 in 2014 and $3,000 in 2015. SEP Plan (Simplified Employee Pension Plan): A SEP plan allows employers to contribute to traditional IRAs (SEP-IRAs) set up for employees. A business of any size, even self-employed, can establish a SEP. Simplified Employee Pension (SEP) plans can provide a significant source of income at retirement by allowing employers to set aside money in retirement accounts for themselves and their employees. 401(k) Plan: A 401(k) is a feature of a qualified profit-sharing plan that allows employees to contribute a portion of their wages to individual accounts. The limit on employee elective deferrals (for traditional and safe harbor plans) is: $17,500 in 2014 and $18,000 in 2015. There are various limitations, thresholds, & procedures for many of the deduction and filings. Please consult your CPA/Tax attorney/or tax consultant for proper guidance with the above subject matter. Suresh Kumar, CPA, MBA is the Principal of Kumar Consulting, PA, a CPA & Consulting firm licensed in the states of FL, KS, and MO and can reached at 813-421-5068 or info@kumarconsultingcpa.com or visit www.kumarconsultingcpa.com.